Book Review: “My Christian Apology” by Martin Murphy | J.W. Wartick -"Always Have a Reason"
My Christian Apology by Martin Murphy provides some unique insight into apologetics. Rather than focusing upon arguments for the existence of God or methodology at the expense of historical understanding, Murphy grounds both arguments and method in history. The book starts off with some introductory notes. What is apologetics? How do we communicate apologetics? These sections provide the groundwork of many apologetics texts. But Murphy quickly differentiates his work from most standard introductions to apologetics. His book focuses largely on epistemology and its relation to apologetics. Murphy does a great job of making these concepts accessible to general readers. He defines epistemology (19) and then gradually eases the reader into its various applications to apologetics (19ff). A central theme throughout is that unbelievers and Christians have common grounds from which they can start discussions. One of these common grounds is Natural Law, which Murphy goes into at length (65ff). Natural Law has been repudiated by many modern thinkers, but it is grounded in Scripture and has a great theological base. I’ve reviewed a Lutheran book on the topic which I think helps show how useful Natural Law is. Murphy points out that Natural Law can provide a basis for knowledge of God. “If we know we are transgressors then we know we have violated the law of God” (73). This knowledge is not saving knowledge, but it provides a basis for judgment (84) and, I think, a possible common ground for apologetics. Another strength of Murphy’s work is the focus upon historical apologetics. He cites Jonathan Edwards at length and in numerous places while exploring Edwards’ applications to apologetics (see 20-21, 29, 36, etc.). He also emphasizes the works of Southern Presbyterians in the area of apologetics. The historical background is a great quality of the work and one that I think Christian Apologists often fail to emphasize or utilize. There is some emphasis on theology in My Christian Apology as well. Murphy’s discussion of natural law leads to a drawing out of the “noetic effects of sin.” Again, the points Murphy raises are clear and concise. Some readers will disagree, but all will be challenged. I find this account eminently plausible and I think that even those who disagree need to at least account for the Biblical case for original sin. 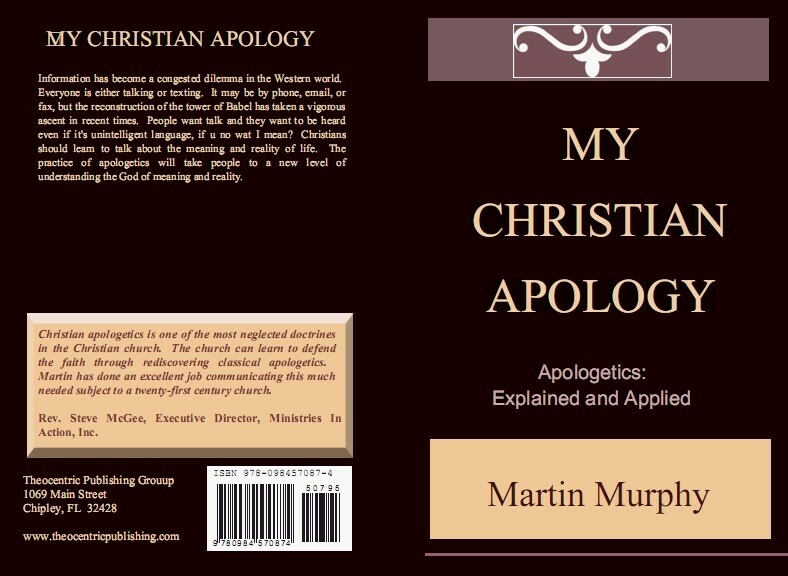 Martin Murphy’s My Christian Apology is a brief work that has a ton of great information packed into it. Questions that other basic apologetics books tend to avoid are treated with precision and lucidity. The emphasis on historical apologetics leads to many insights readers won’t find in other introductory works. I recommend that readers use this book along with other basic apologetics books in order to develop a more well-rounded apologetic method. Martin Murphy, My Christian Apology (2010).